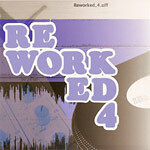 The fourth installment of the Reworked series! Features hot remixes of tracks by Nas, Pete Rock & CL Smooth, Camp Lo, Common, Mobb Deep, Jurassic 5, O.C., and more! Noted remix producers: Mums The Word, Nobody, Choice 37, Presto, Josh One, and more!